Efforts are ongoing to develop and evaluate fluorescence-based diagnostic technologies for the detection of premalignant and early stage malignant lesions in many organs. These exploit either naturally occurring autofluorescence (AF) from endogenous fluorophores, or fluorescence caused by an exogenously administered fluorescent drug, e.g., 5-aminolevulinic acid. Dr. Tajiri and his colleagues have studied AF emitted from endogenous fluorophores. Dr. Tajiri clarified that collagen, which fluoresces in the green wavelength range, is one of the major sources of tissue AF and it is important to take into account of tissue component changes in addition to changes in gross tissue morphology. These may include alterations in the local blood volume, tissue metabolic activity, and relative fluorophore concentrations. It is often difficult to recognize the margin of neoplastic lesions, especially of flat type tumors of the colon, with conventional endoscopy as shown in figure (upper left). 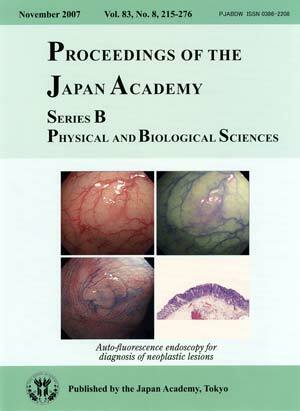 Therefore, AF endoscopy has been studied clinically in the colon. Almost all epithelial neoplastic lesions were observed to have a magenta color whereas the normal background mucosa was green with AF endoscopy and the margin of the lesion could be clearly recognized (upper right) as with an indigocarmine-spraying endoscopic image (lower left). Histologically, this lesion was diagnosed as adenoma of 10 mm in size (lower right). On the other hand, all non-neoplastic hyperplastic polyps demonstrated the same color as surrounding mucosa. Thus utility for differential diagnosis of epithelial neoplasia and non-neoplasia was indicated, because of the change to magenta color. There is already considerable evidence that AF endoscopy has promise for diagnosis of early carcinomas and premalignant lesions in the gastrointestinal tract as an adjunct to conventional endoscopy. In particular, it has good potential for identifying small or flat tumors and tumor margins, as well as premalignant lesions, and for assessing grade and selecting reasonable therapy.